(a) Form. Every affidavit shall run in the first person and be divided into numbered paragraphs as in pleadings. The caption shall include a designation of the particular proceeding the affidavit supports or opposes and the original date, if any, fixed for hearing. Ex parte affidavits may be taken outside the State by a person authorized to take depositions under R. 4:12-2 and R. 4:12-3. (c) Facsimile Signature. If the affiant is not available to sign an affidavit or certification, it may be filed with a facsimile of the original signature provided the attorney offering the document certifies that the affiant acknowledged the genuineness of the signature and that the document or a copy with an original signature affixed will be filed if requested by the court or a party. Requirement for Original Signature. Every affidavit or certification shall be filed with an original signature, except that a copy of an affidavit or certification may be filed instead, provided that the affiant signs a document that is sent by facsimile or in Portable Document Format (PDF), or similar format by the affiant and provided that the attorney or party filing the copy of the affidavit or certification files the original document if requested by the court or a party. Prior to this amendment, “an affidavit or certification . . . [could] be filed with a facsimile (faxed) signature, if the attorney offering it certifies that the affiant acknowledged the genuineness of the signature and that the document or a copy with an original signature will be filed if requested by the court or a party.” Bank v. Kim, 361 N.J. Super. 331, 342 (App. Div. 2003). In other words, faxed signatures on affidavits and certifications were acceptable as long as the attorney completed an additional certification. The recent amendment, effective September 1, 2014, clarifies that the affiant may sign a document that is sent by fax, PDF, or any similar format. The amendment also removes the attorney certification requirement and requires only that the attorney produce the original document if requested by the court or a party. This is obviously a great revision because it acknowledges the prevailing use of PDF documents. It is also suspected that this rule was amended in contemplation of a future electronic filing system for the entire NJ Court system. The Jersey Journal reports that the Hudson County Superior Court will revert to normal hours on Monday, June 30, 2014. The court hours, which had been changed to 10:00 a.m. to 6:00 p.m. because of anticipated traffic from the closing of northbound lanes of the Pulaski Skyway, will return to 8:30 a.m. to 4:30 p.m. Assignment Judge F. Peter Bariso Jr. explained that the impact of the closing was not as great as as predicted. Judge Bariso should nonetheless be commended for his diligent, proactive measures in the face an uncertain traffic situation that was predicted to be incredibly disruptive to local traffic in Jersey City. In the unpublished case of Gold Medal Bakery, Inc. v. Super Bread II Corp., decided May 21, 2014, the Appellate Division reiterated firm guidelines for the discovery of a party’s immigration status. Specifically, the Appellate Division agreed with the reasoning of Serrano v. Underground Util. Corp., 407 N.J.Super. 253 (App. Div. 2009), which held that permitting discovery into an individual’s immigration status is “fraught with the potential for undue prejudice” and should not be permitted absent “a meaningful nexus … to overcome the obvious prejudice that will follow from such inquiry.” Id. at 286. In other words, the analysis “start[s] with a presumption that any inquiry into matters of immigration status is not appropriate” and “place[s] the burden on the proponent to demonstrate, beyond the issue of credibility, why such inquiry is germane to the issues in dispute.” Id. at 286. Because the plaintiff could not prove that there was a “meaningful nexus” for the discovery of defendant’s immigration status, such discovery was prohibited. 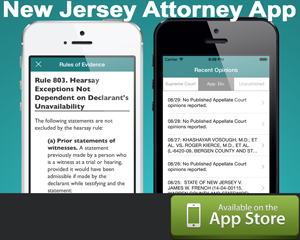 Effective September 1, 2013, all New Jersey attorneys must include their attorney identification number in the space above the case caption at the left-hand margin of the first sheet of every paper filed with the court. Format; Addresses. At the top of the first page of each paper filed, a blank space of approximately 3 inches shall be reserved for notations of receipt and filing by the clerk. Above the caption at the left-hand margin of the first sheet of every paper to be filed there shall be printed or typed the name and the New Jersey attorney identification number of the attorney filing the paper, office address and telephone number or, if a party is appearing pro se, the name of such party, residence address and telephone number. No paper shall bear an attorney’s post office box number in lieu of a street address. An attorney or pro se party shall advise the court and all other parties of a change of address or telephone number if such occurs during the pendency of an action. If you do not know your attorney identification number, then simply type your first and last name in the NJ Attorney Index. In MAGDALENA JAROSZ v. G&B LLC d/b/a THE ROYAL MANOR, and KIDA, LLC, the Appellate Division affirmed Judge Menelaos W. Toskos’s grant of summary judgment, which dismissed plaintiff’s personal injury complaint. While employed at the Royal Manor as a waitress, plaintiff assisted another server in wheeling out a flaming pig on a serving cart into the banquet area during a wedding reception. The other server, who was inexperienced and lacked proper training, periodically poured grain alcohol onto the pig to keep the flame going. Eventually, the flame erupted, causing severe burns on plaintiff’s right hand, forearm, and right abdomen. Kida, LLC is the owner/landlord of the Garfield property where G&B, as tenant, operates the Royal Manor. Defendants shared a common principal, Dariusz Kida, who maintained an office at the Royal Manor, was involved in the restaurant’s day-to-day operations, and was aware that there was going to be a presentation involving a flaming pig during the wedding reception. Plaintiff commenced a lawsuit in the Law Division for her personal injuries. Plaintiff alleged that her employer, G&B, acted in a manner that it knew was certain and/or substantially certain to result in harm to her; in other words, she tried to invoke the “intentional wrong” exception to the Workers’ Compensation bar. Plaintiff further alleged that the landlord, Kida, breached a duty to her and others to keep the property in a reasonably safe condition. It is well established that, under the Workers’ Compensation Act, an employer is not otherwise liable for a workplace injury except in the event of an intentional wrong because New Jersey’s Workers’ Compensation Act is “designed to establish a no fault system of compensation for workers who are injured or contract a disease in the course of employment.” In other words, an employee trades his right to sue for immediate Workers’ Compensation benefits. To be entitled to those benefits, the employee must merely show that his injuries arose out of the course of his employment. Applying decades of well-established case law, the Appellate Division agreed with Judge Toskos that there was no evidence that the employer knowingly exposed plaintiff to a virtual certainty of harm. There were no safety violations that the employer refused to remedy, and certainly none that related to flambéing activities at the Royal Manor. In fact, that particular flaming-pig presentation had not occurred before, and so there was no certainty that an injury was going to occur. The Appellate Division also agreed with Judge Toskos that an employee getting burned was an expected risk of working in a restaurant. Accordingly, summary judgment was properly entered in favor of the employer. The Appellate Division also agreed with Judge Toskos that the landlord could not be liable under the facts presented. There was no proof that the landlord controlled the restaurant’s operations or had a duty to do so. The Appellate Division found that the flambéing activity at issue here was exclusively within the control of the restaurant, not the landlord, even if the principal of both businesses, Dariusz Kida, was on the premises at the time of the injury. The presence of the principal was not enough to impose liability on the landlord because there was no evidence that the principal was present for any purpose other than his day-to-day supervision of G&B’s restaurant business. Absent a basis to pierce the corporate veil, the Judge Toskos correctly noted that Kida and G&B were separate entities, and the fact that they had a common principal was insufficient to confer liability on the landlord for the actions of its commercial tenant. Summary judgment in favor of the landlord was especially appropriate because there was no showing that the flambéing activities were unusual or presented a problem in the past.